This post was originally written by Brent Schooley. Last week, Apple pulled the trigger on the iOS 7 update. Tons of apps have been updated (just check your updates right now, you’ll see) and those that haven’t stick out like a sore thumb on the new operating system. I know a lot of people who are not excited about iOS 7. For many, it’s because they don’t like the aesthetic changes. However, I feel like everyone who is able should upgrade to iOS 7 immediately. Since I feel so strongly about this, I want to share my three favorite new features of iOS 7 and why I think they make iOS 7 a must upgrade. 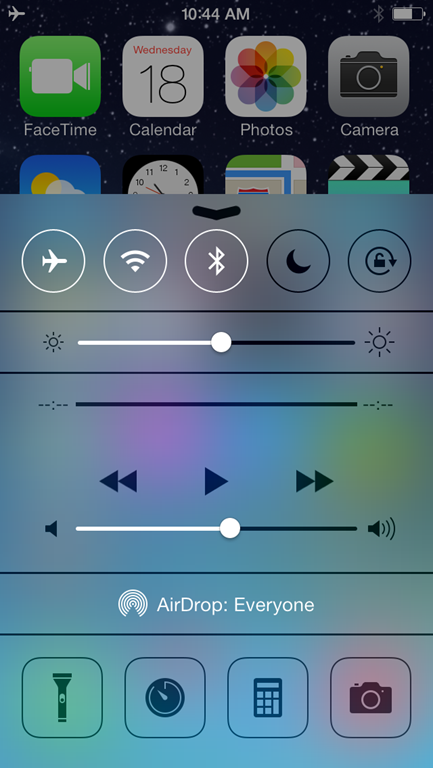 Honestly, this is my absolute favorite iOS 7 feature and it is easily the thing that everyone should upgrade for. It will change your iOS usage patterns almost immediately after you remember you don’t need to go to the Settings app anymore. 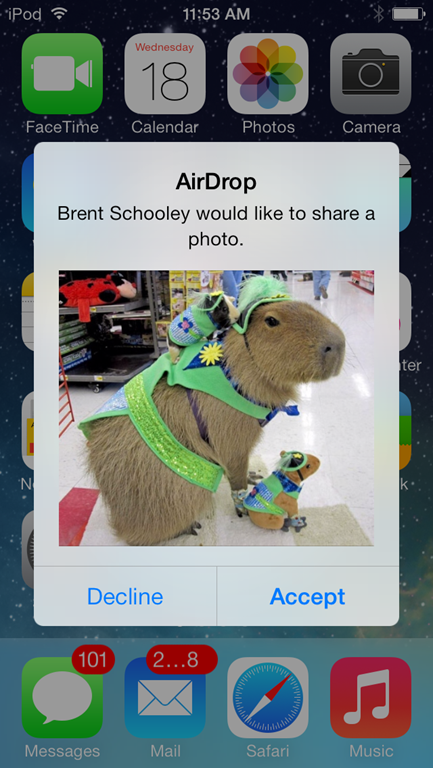 My second favorite feature of iOS 7 is AirDrop. AirDrop allows you to send photos, videos, contacts, and even files (if you have the right apps) from one iOS 7 device to another. No setup is required and you can even send these files to a person you just met. 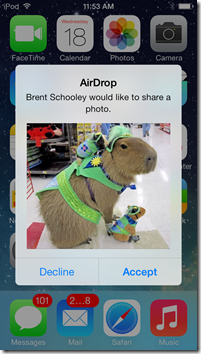 Anything that can be shared using the Share button within an app is eligible to be shared through AirDrop. This makes apps like Dropbox and GoodReader, which manage files, incredibly powerful in an AirDrop workflow. I can easily send anything from my iPhone to my iPad using AirDrop and vice versa. 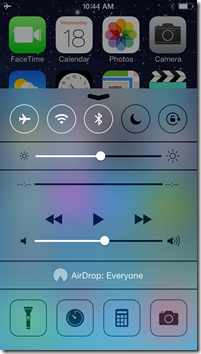 You can configure AirDrop so that no one can see you, only people in your Contacts list can see you, or everyone with an iOS 7 device near you can see you for AirDrop. Transfers occur over WiFi Direct or Bluetooth, and are really fast. They’re also encrypted for a little bit of extra security. Try it, you’ll like it. My only gripe is that, for now, AirDrop doesn’t work with the Mac (which has had the feature for a while). Here’s hoping this comes in OS X Mavericks and iOS 7.1. This is something you won’t be able to see because it’s one of those “behind the scenes” developer features that will slowly make its way into your favorite apps. Apple has finally allowed applications to periodically run tasks in the background to keep their content fresh while they aren’t running. In order to keep the impact on battery life and network usage low, there is a limit to how often this will occur and it will only work on applications that are still running in the background. Where this feature will be huge is for applications like Facebook. I use Facebook on the iPhone a lot and the most annoying thing about the application is waiting for it to update the timeline and then load the notifications (which is what I opened the app for in the first place so the ordering is weird). In theory, and hopefully in practice, Facebook can update their app for iOS 7 to periodically load new stuff into my timeline and notifications so that when I come back to the app the new content is already there. This will be awesome once all of my favorite apps implement this new feature. My top three features only scratch the surface of what has been added to iOS 7. I’ve intentionally avoided the visual refresh because I realize it is a touchy subject. I really like the visual changes, but I know a lot of people aren’t as fond. That’s fine, and they’re entitled to that opinion. However, the functional changes to the OS should not be ignored because of the visual changes. So, I think everyone should run, not walk, to update their devices. You won’t be disappointed.